If you would like to add novelty to your mobile phone, a good idea might be to change its ringtone. The multifunctional AVS Audio Converter will allow you to edit your favorite audio track, convert it to a compatible format and upload the resulting ringtone to your mobile device via USB, Bluetooth or Infrared connection. The guidelines below will help you perform these tasks. 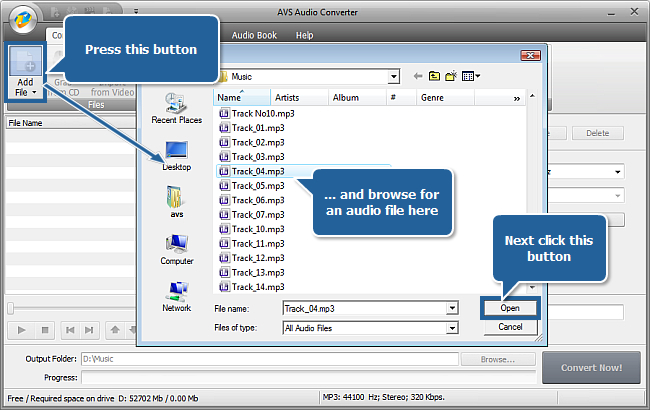 Follow Start>> All Programs>> AVS4YOU>> Audio>> AVS Audio Converter to launch AVS Audio Converter on your PC. After you have pressed the Open button, the selected audio file will be imported into AVS Audio Converter. 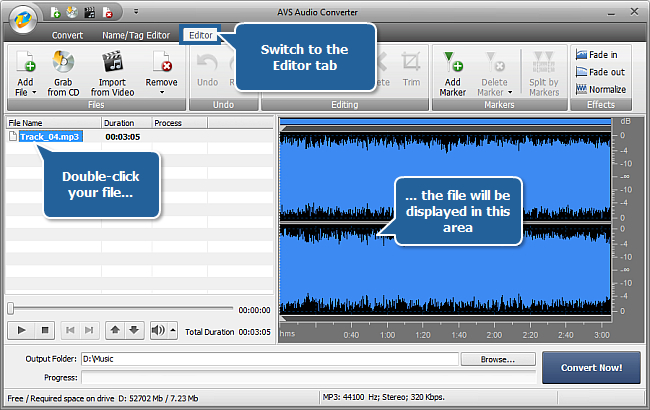 With AVS Audio Converter you may edit an audio file prior to transferring it to your device - delete unwanted parts or apply effects. To start editing the audio file, switch to the Editor tab, next double-click your file to place it in the edit area. When done, the audio file will be visualized in the edit area on the right. You might not want to use the whole audio track as a ringtone. 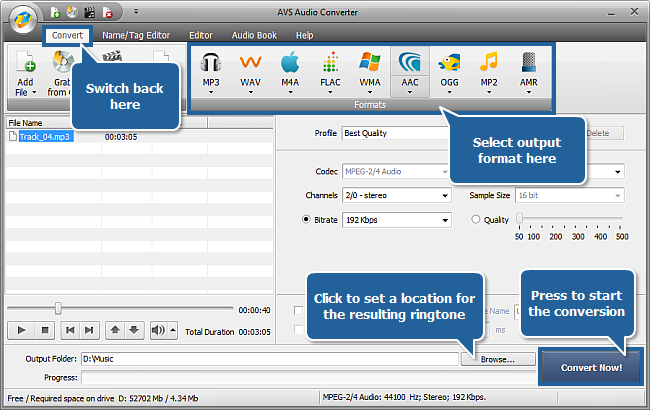 AVS Audio Converter will allow you to delete unwanted parts from the audio track before uploading it to your mobile device. in the edit area, select a part of the audio track with the mouse and use the Trim button to delete everything except the selected fragment. 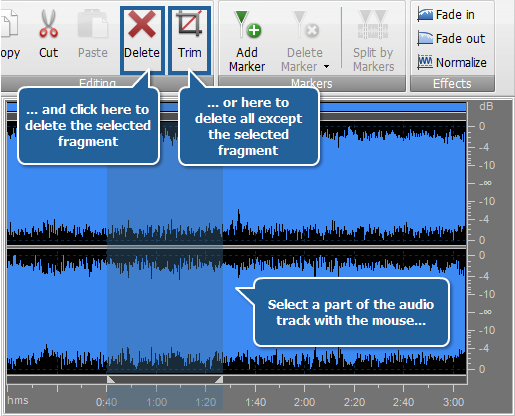 in the edit area, select a part of the audio track with the mouse and use the Delete button to delete the selected fragment. You may apply the Fade in, Fade out and Normalize audio effects to your future ringtone to make it sound more smooth. Visit the Editing Audio chapter of the online help to learn more on how to apply effects to audio tracks in AVS Audio Converter. After the editing of the audio track is over, save it to a format supported by your mobile device. Switch back to the Convert tab and select the necessary output format by clicking its corresponding button. Note: you can click the black arrow below the MP3 button and select the Ringtone profile from the drop-down list. Select a location for your ringtone - press Browse next to the Output Folder field and set a location on your computer HDD. Finally, press Convert Now! to start the conversion. Connect your mobile device to your computer using USB, Infrared or Bluetooth connection. Switch on your device. Click the Upload... button in the opened window. 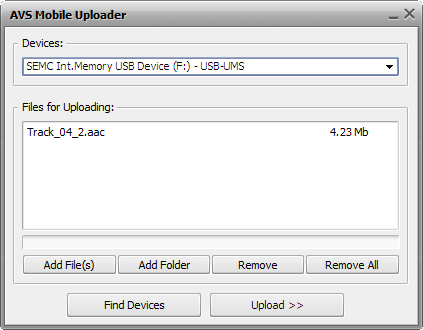 This will start the AVS Mobile Uploader application. In the opened application window, press Find Devices if no mobile device has been detected. If still no luck, visit the Troubleshooting page for more information. Press Upload>> to start uploading the converted file to your mobile device. Wait a few moments while the application transfers the file to your device. Your ringtone is ready to use. Set it as your current ringtone and ask your friend to make you a phone call!